A long pedestrian street crowded with shoppers, vendors and sightseers connects Lima's two main plazas (squares) to each other. The heart of the old town is centred on the striking Plaza Mayor, or Plaza de Armas, gracefully colonial with its bronze fountain and old street lamps. It was once the central marketplace, where bullfights were held during Spanish rule. Surrounding the square are several notable buildings, including the grand Spanish Baroque Cathedral, occupying the site of an ancient Inca temple and housing the Museum of Religious Art and Treasures; the impressive Government Palace, where the changing of the guard takes place; the Town Hall; and the Archbishop's Palace, which sports a beautiful wooden balcony. The Plaza San Martin is also an impressive square with a hive of activity surrounding its central fountains; a busy area of shoe-shiners, soapbox speakers, and street artists, and the site for political rallies and rioting workers. Although the plaza is usually a peaceful and jovial place to visit, and wonderful for photographs, tourists are advised to avoid the area when political rallies and protests are underway, as these rallies occasionally turn violent. 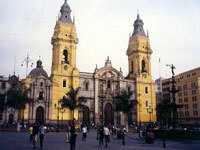 Most visitors choose to start their sightseeing in Lima in these two plazas. Address: Jr. Junin and Jr. Carabaya.